Take a comprehensive 9-hour guided tour of Oregon's national scenic area, the Columbia River Gorge. See the breathtaking landscape from the water on a 2-hour brunch cruise; cruise east toward Hood River, then west to Bonneville Dam, and finally return to the town of Cascade Locks. Then board your private vehicle to drive into the mountains to experience this agricultural area, known for its production of pears and wines. Drive along the Fruit Loop, stop at local farm stands, and drive up the Mount Hood Scenic Byway to reach Timberline Lodge, located over halfway up the side of Mount Hood. Tour is limited to a small group of a maximum of 14 people. Your scenic tour begins with pickup from downtown Portland hotels or the central meeting location at 8:30am. First drive through the Columbia River Gorge national scenic area to the town of Cascade Locks. 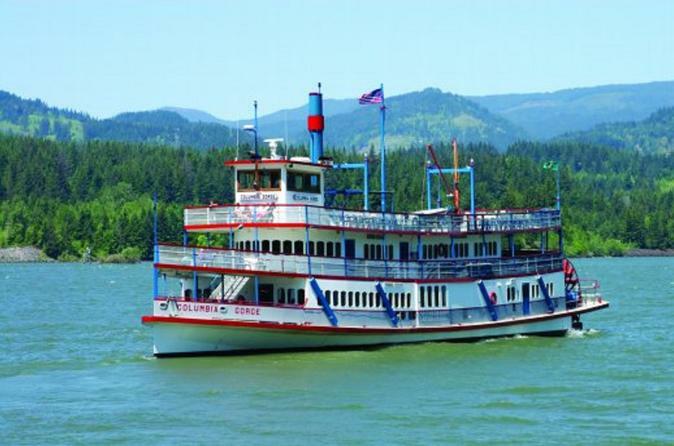 Here, stop at the marine park to board the Columbia Gorge Sternwheeler for a 2-hour brunch cruise. The cruise includes a buffet-style champagne brunch complete with a variety of breakfast, lunch and dessert items, as well as champagne, sparkling cider, orange juice, coffee, and hot tea. Other beverages from the full service bar are available for purchase. Sit inside, eat and enjoy the incredible views, then head outside and walk around on the decks. Feel the northwestern wind, inhale the fresh air, take amazing photographs, and soak up some sun. If you would like, head to the top deck, meet the ship captain, and steer for a few minutes! After the cruise, journey to the town of Hood River. The windsurfing capital of the world, it is likely you will see windsurfers and kite-boarders out on the Columbia River. Drive along the Fruit Loop, a 35-mile scenic route, past gorgeous pear, cherry, apple, nectarine and peach orchards. Stop at a stunning viewpoint to see Mt Hood and Mt Adams. Known for being the nation's top producer of pears and apples, don't miss the chance to stop at farm stands located just outside of Hood River. Here you may purchase fresh and locally grown fruit (own expense). Continue with a drive on the Mount Hood Scenic Byway. As the byway climbs toward Mt. Hood, the agrarian valley segues into the Mt. Hood National Forest. Visit Timberline Lodge and enjoy its magnificent architecture and art. Declared a National Historic Landmark in 1977, Timberline Lodge is one of Oregon's most popular attractions, drawing nearly two million visitors every year. Considered an architectural wonder, it is still being used for its original intent- a magnificent ski lodge and mountain retreat for all to enjoy. Built in 1936 as a home for skiers and climbers, Timberline is today home to North America's longest ski season. In the height of winter, the ground floor of the lodge is typically fully buried in snow, with entry through a snow tunnel, or directly into the second floor. After spending time in Timberline Lodge, journey back to Portland through the towns of Rhododendron, Zigzag, Welches, and Sandy. Tour concludes with drop-off at your downtown Portland hotel at approximately 5:30pm.